The two transnational cooperation programs, Southeastern Europe and Central Europe (South East Europe and Central Europe) funded five new projects under the auspices of the Danube Strategy, with a total budget over 10 million Euros. A strong signal was sent from Serbia, allocating 19 million euros for the Danube Strategy projects keeping in mind the budget for Pre-Accession Assistance (IPA) for 2011. What is interesting is the complete lack of transparency of the selected projects. Following the accession of Romania and Bulgaria into the EU in 2007, the Danube has become "internal" EU waterway. As one of the Trans-European Corridor (Corridor VII) Danube River is the main waterway through the territory of the Union. Over the Rhine river channels associated with the North Sea - the water is a direct link between the North and the Black Sea. Navigation and multiply modal transportation are possible at a distance of 3000 km (from Constance to Rotterdam), of which the length of the Danube waterway 2400 miles. The Danube region is a heterogeneous area in economic, environmental and cultural aspects. States in the Danube basin share many common resources and they are connected with each other. This means that events in one part of a very rapid and have consequences for the entire region. The Danube River Basin has about 115 million citizens of the EU, almost every fifth citizen of the Union. Life of 20 million people is directly dependent on the Danube. It covers an area of 800,000 km2. The Danube Basin is home to about 300 species of bird special. Cruising the Danube reaches only 10% of those taking place on the Rhine. It has been calculated that the increase in capacity in the path of Black and North Sea by 30% over 5 billion tons of freight could be diverted to the waterway. The Danube Strategy is not only focusing on the coastal countries along the Danube, but in the whole Danube basin. The strategy is based on "macro-regional" approach to 1 - a new approach to the EU, which reinforces the synergy between the various policies and coordinates the efforts of a wide range of actors (regions, municipalities, international organizations, financial institutions, economic social partners and civil society). Overall, the Danube Strategy is designed to function greater prosperity, security and peace for the people of the region, particularly through the strengthening of cross-border, transnational and trans-regional cooperation and coordination. The strategy is both integrated (covers and connects a number of policies) and focused (concentrated on the main topics of interest to the entire macro-region). • After separation conflict and the EU Danube Strategy (short EUSDR) should serve as a structural concept for addressing common challenges. Four strategic political objectives identified in the beginning: (1) Connecting the Danube Region, (2) protection of the environment in the Danube region, (3) Building prosperity in the Danube region, (4) Strengthening the Danube region. Structured through the four pillars of cooperation, Danube Strategy provides a policy framework for trans-regional cooperation. EUSDR backbone is focused organizational structure based on shared responsibility. Eleven thematic priority areas form the heart of the Strategy, namely: (1) Inland waterways and railways, road and air transport, (2) energy, (3) Culture and Tourism, (4) water quality, (5) Environmental risks (6) Biodiversity, (7) ICT and Knowledge Society, (8) Competitiveness and Cluster Development, (9) Investing in people and skills, (10) Institutional capacity and (11) Security. Each priority area coordinate representatives of the two Danubian countries, so that under the EUSDR, now works for [a PAC-11's (Commission working group within certain priority areas), representing 11 new institutions under the auspices of the EU! (Thereby undermining two of the three basic requirements for the implementation of the Danube Strategy: There are no new institutions and new funds? Course, although very limited, resources are not negligible, constituting a total budget of 2.42 million euro, for all rats received individually by the 220,000 euro annually, which is not a negligible figure. Yet progress has been made in the use of existing policies and programs for the implementation of the EU Strategy for the Danube Region. A preliminary agreement has been reached between the European institutions and countries that are not EU members, to using the 2014-2020 program budget, especially the Structural Funds, the guidelines form a specialized new programs for more efficient implementation of the Danube Strategy. 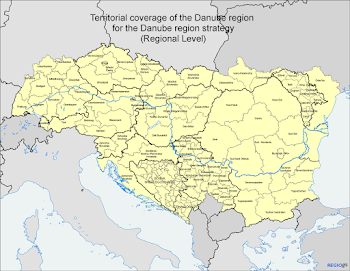 The EU Strategy for the Danube region can significantly contribute to achieving better coordination between regional and local authorities and organizations working in the Danube region and would certainly allow prosperity, sustainable development, job creation and security in the region ... provided that they comply transparent and level playing field for all participants. Cooperation in the Danube region has a long history: the Danube Commission was established on 30th March 1856th The first headquarters were at Galco (Romania), and today is based in Budapest. The Danube Commission was one of the first European institutions. After the extension of the 2007th Danube became inland water route EU, the Balkans and the Middle East. The Danube is an effective waterway and outside the Member States and with the (river) Rhine-Main channel connects the North Sea with the Black Sea. This has the potential to strengthen the geostrategic position of the region of the Black Sea. The Danube region is interconnected area with heterogeneous economic capacity. Access to this region as a single macro-region would help overcome regional differences in economic performance and support to integrated development.